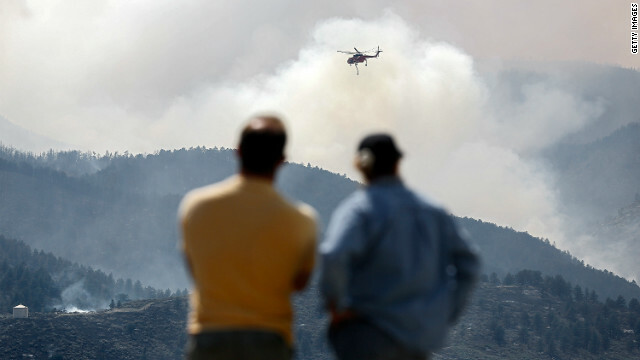 A firefighting helicopter prepares to drop water on a wildfire in Colorado this month. Editor's note: Micah Zenko is a fellow for conflict prevention at the Council on Foreign Relations. The views expressed are his own. This article originally appeared at CFR.org. “Oppressive Heat,” “Chimp Attacks,” “Sharks,” “Forest Fires,” “Africanized Bees,” “Death by Drowning.” These hard-hitting reports have been staples of the mainstream media since Publick Occurrences: Both Forreign and Domestick first hit the presses in September 1690. Today, news broadcasts and reality television depict harrowing tales of the enemy that Americans must collectively fear and face: nature. Outside of our climate-controlled studio apartments, McMansions, and office cubicles, nature doesn’t simply exist, but happens to us: sharks choose to swim dangerously close to popular beaches, chimpanzees lure humans into their cages, and forest fires and raging floods dare to strike picturesque neighborhoods, and pools (or watery graves) rest in backyards, beckoning humans to dive in. Beyond our personal safety and peace of mind, nature poses a threat to critical infrastructures once exclusively targeted by al-Qaeda. Solar flares (or God’s Electromagnetic Pulse) disrupting the electric grid is “arguably the largest natural-disaster scenario that the nation could face.” That’s no joke. A 2008 study by the National Academy of Sciences estimated that a “severe geomagnetic storm scenario” could cost the United States up to $2 trillion in the first year, as compared to its “weakling” cousins Hurricane Katrina (roughly $125 billion) or the 2003 blackout in the northeast ($10 billion, or the equivalent of a month of war in Afghanistan). Despite the catchy headlines, nature slew a paltry 3,168 Americans – or 1.2 percent of all deaths – in 2008 (the most recently updated data). In comparison, Americans are nearly eleven times more likely to die in an automobile accident than fall victim to nature. And a stickler could point out that more than 80 percent of all forest fires are started by humans, virtually all climate scientists attribute global warming to human activities, and that the installation of a four-sided fence around a pool reduces the likelihood of children drowning by 83 percent. Such statistics are nature’s way of seducing you into the antiquated notions that we have agency over our lives and that protecting the earth is a shared societal responsibility. To get a sense of the scope of this scourge, see below for Mother Nature’s kill list (click to expand), and how it compares with the relatively overblown (albeit very real) threats of noncommunicable diseases, firearms, and automobiles. So the next time you’re thinking about going for a drive to your favorite restaurant or shooting range, play it safe and stay indoors. Did you all miss the point of the article. Nature killed fewer people than diseases, cars and guns. Yes, I think some of the folks who commented must have skimmed it and completely missed the point. Didn't we all have to read "A Modest Proposal" in high school? So, death by 'non-communicable disease' is not due to nature?! Anyone notice that, of all those deaths, drowning was the single biggest contributor? 43% of the total (not including that one death via "Contact with marine animal")! Friends don't let friends swim! Don't go in the water, man!!! You should be fearing God the creator of earth more than the earth itself. He created it and will destroy in the end. If you are saved you will join Him in the New earth he will create. You people are nuts. In another few decades religion will be swept into the dustbin of quaint but persistent anachronisms from an early phase of our species's development. Why doesn't this list include the 2004 Tsunami that wiped out 250,000 people in a single day. A tsunami killed 250,000 Americans? Really? Read much? To live as a human being is to pollute the environment from the very start until the very end. If all the pieties we hear and read about saving the planet really mattered to us, mankind would have been promoting birth control on a massive scale ever since it became possible to do so early in the twentieth century. Massive numbers of human lives doomed to misery and early death would not have been prodced. Massive numbers of those human lives could not have be used to flood countries of the West that had attained a desirable level of well-being thanks to birth control. There is not a single problem facing the planet and ourselves that is not somehow connected with the sabotage of meaningful birth control policies. There is not such thing as mother nature, but there is a God. Romans 1:20- "For since the creation of the world God’s invisible qualities—his eternal power and divine nature—have been clearly seen, being understood from what has been made, so that people are without excuse." Q – How do we know there is a God? A – The Bible tells us so. Q – Why should we believe the Bible? A – Because, it's the word of God. Q. How do we know there is a GOD? Q. Why should we believe the Bible? A. Because things foretold in the Bible thousands of years ago are coming true today. Also no book has more accurate prophecies than the Bible. And just to throw it out there the Bible is the most powerful and popular book in worlds history. Q. How do you know the empire state building has a designer? A. Because well desigend and constructed buildings do not coincedently pop up out of know where. Q. Is the worlds engineering more complex than anything man has made? A. Hell yes by infinity. No millipede is venomous. Rats and mice cause main health issue by spreading deadly hanta viruses in urine. Biting attacks are not the safety concern here. I don't regard this list as authentic. It seems to have been constructed by the uninformed. rats are worshipped in India by hindus. they drink rat pee also. More than 2000 years ago Jesus spoke of the things happening today (End of time). Matthew 24:7-"Nation will go to war against nation, and kingdom against kingdom. There will be famines and earthquakes in many parts of the world." Luke 21;11-"There will be great earthquakes, famines and pestilences in various places, and fearful events and great signs from heaven." Oh yeah? Read Luke 22:36. Dedinitely describes one of Jesus' bad hair days. HAHAHAHAHAHAHAHAHAHAHAHA lolol omg lololoololol omg bro that was probably one of the funniest and most original jokes ive ever heard in my entire life. wow that ws funny, make sure you tell your family and friends that yesterday you posted the funniest joke about Jesus. Good one good one your on your way buddy. That is funny. Haven't those prophecies come true before? Oh, those must have been a mistake by the flawed views of the flawed humans who observed the events. Either that or your God has one sick sense of humor. Everybody keeps wondering when the World will end. If you listen to those whom have certain religious beliefs it will be very soon. But I have always believed that the World will be here as it always has. It won't end.......but man's time on it just might. Between killer comets and astroids, nuclear weapons, and natural disasters the Earth will be battle scarred but not destroyed. Man on the other hand will probably come as close to extinction as possible. I am surprised there was not any deaths by rat bites, While in the Philippines my son pointed to a large rat and said "hay dad look at the opossum", I replied that is not a opossum. Ha ha! Good one! I live deep in the mountain forest and I finally had to board up the doggy door to keep those 'giant rats' out of my cabin and eating up my cat's and dog's food! The writer picked 2008 to show the low number of deaths attributed to nature. How about 2004 when a quarter of a million people were killed by the tsunami? Well if you made a list like this for the Dinosaurs, it wouldn't have predicted what happened to them. 1big meteor ....100% death rate. Mother Nature Shall kill off all wicked devils with her Scorching Heat! Remember we are the top of the food chain, when we see a cow we imagine hamburger. As ends meet, when germs, bacteria and virus 'see' uswe are seen as 'food' .